This is a very rare original American Indian Dag knife and beaded sheath attributed to the Blackfoot (Blackfeet) Native American Indians and dating to circa 1820-1840’s. This “Chief’s Grade” or “Presentation Grade” knife was owned by noted collector Marcus Chernoff who sold the piece to noted author and collector Mark Francis. The dag knife features polished black Great American Bison Buffalo horn grips secured with ten copper rivets being framed Buffalo bone washers. This style of ornate dag knife is referred to as a “Chief’s Grade” or “Presentation Grade” knife as they were given to Chief’s and tribal dignitaries during trade negotiations and treaty signings. The forged iron knife shows a raised median ridge running down the center of the blade, a documented early weapon features also seen on dag knives dating to pre-1850. The piece was part of the famed antique weapons collection of Arnold Marcus Chernoff. American Indian early dag knives are commonly referred to as “Beaver Paddle/ Beavertail” dag knives. This is due to the fact most dag knives were traded on the frontier along the Great Lakes region through the St. Lawrence seaway westward by early fur traders. 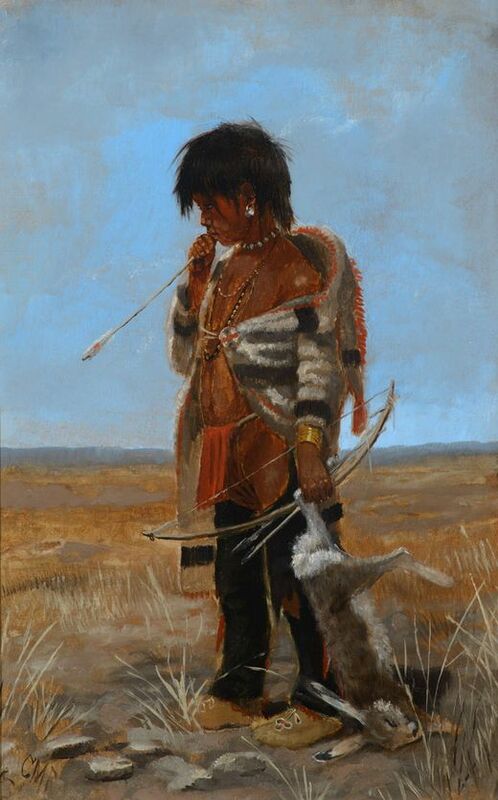 From the Great Lakes region on westward the knives became very popular among the Northern Plains/Upper Plateau tribes such as the Cree, Metis, Blackfoot, Nez Perce, Chippewa/Ojibiwa and Shoshone. These were made to be killing weapons, this is why dag knives show a clean long double-sided blade without any serration as they were for battle. Unlike other knives worn by Indian Warriors the dag knife would have been worn around the Indians neck on his chest. The piece comes from the same collector as the Dag Knife sold by our company on 4/29/2017 for $10,200 (with premiums) that was authenticated by the Sotheby’s expert David Roche and from the same collection as the Cree Dag Knife with Sheath that sold for $12,300 (with premiums) at our companies 8/25/2018 sale. The piece shows the proper signs of age and use with minor dings and scratches and a fine patina. Measures overall 14.5”L by 2”W.